Great to welcome @POTUS to MO. He spoke compassionately about #HurricaneHarvey victims & pledged to RECOVER, REBUILD, RESTORE. 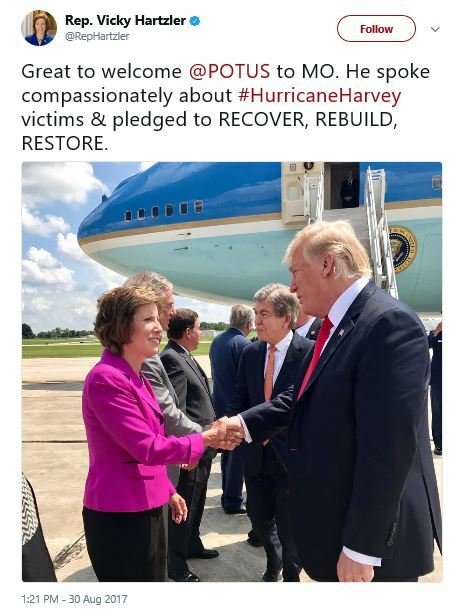 Why that’s Representative Blaine Luetkemeyer (r) and Senator Roy Blunt (r) in the picture, too. They also own it. Only because he forgot about #HarveyFlood victims yesterday. Compassion is not part of Trump’s nature, but nice try. Did you tell him you voted no on Hurricane Sandy relief? This is the pic that will cost you your seat. Promise. Boo! Hiss! Why can YOU not see his ignorance, hatred, and superstition? These are NOT good qualities of a leader. #MODeservesBetter than 45.
he’s a putz; you’re his pawn. you literally enable him to fleece America and our state, Missouri. good picture! I’ll archive it. Always a slogan….did he even know your name???? Does he know you are not the representative from Texas? My god, you’re an embarrassment. This will be embarrassing for the Hartzler family for a couple hundred years. He lies as usual and you swallow it all because you want to, not because you think it’s true. Vicky was out of the 4th District , smooching Donald ! !